The Perch is the first and one of the most important forums in the Roost. I will admit that I did not know what it was called until one day when Kyrie mentioned it and I asked, “What’s the Perch?” Needless to say, after being forced to do all of Kadina’s quidditch laundry, I remembered the forum and felt it prudent that everyone knew of its specialness. The Perch is Rhi’s dominion and the place to go for announcements about events and changes in Ravenclaw. When one first signs onto the Ravenclaw forum, one should first check for new announcements in The Perch. For example, when there is a new prefect it will be posted in the forum. The oldest posts available are in a thread to congratulate to the Ravenclaw Quidditch Team for winning the Quidditch Cup back in April of 2005. Now, in 2011, the Perch is still used to inform and provide a place for people to congratulate RQT after a particularly good season or a person that has risen in the Ravenclaw hierarchy. One of the most important threads is the “Points Opportunities!” thread, which tells all house members of the opportunities they have to earn points. (I know, the name is pretty self-explanatory). This was started by Prof. Scarlet Leslie at the request of Maya Winters and is extremely helpful (especially for new members) to show how an HOLer can be active. It has a run-through of the various opportunities along with links and often a breakdown of the amount of points that can be earned per activity. For house newspapers, contests, HOL Library and Art Department projects, it also shows the deadlines. Updated regularly, this is an extremely helpful tool for navigating around HOL and helping Ravenclaw in the House Cup competition. 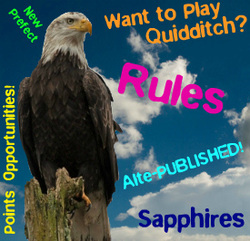 Another thread on the forum that is a must-check for all Ravenclaws is the “Sapphires” thread, which explains the in-house point system. Started in September of 2009, members can check how they’re doing from a spreadsheet that is updated monthly and hyperlinked in the thread. This is just another useful aspect of The Perch!